It is thought that the first Prances to populate the South West migrated to North Devon from Yorkshire in the fifteenth century. From there a spur went south to the Plymouth area before a branch was formed from the Plymouth Prances in Hampstead, London. From the 1500's a branch was also living in Glamorganshire. North Devon Prances Historically these families were grouped around the Bideford area and were mainly seafarers or shopkeepers. Notable amongst them were Sea Captains and Fishmongers, many of them owning their own fishing boats. Thomas Prance One of the most famous Prances from South Wales is Thomas Prance who came from a long line of sea captains. In 1793 he was in command of the 'Joseph' off the coast of North America when she was taken by the French. 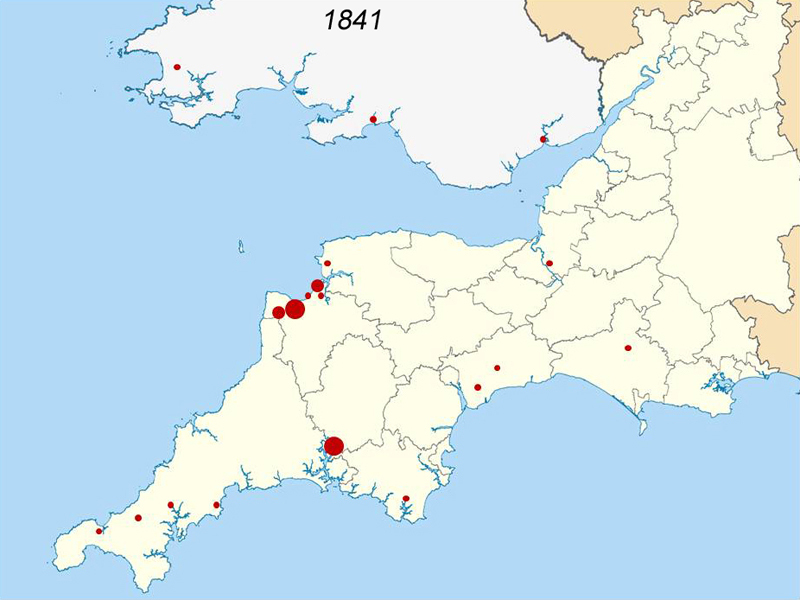 A search of the census records for 1841 revealed a UK total of 256 Prances of which 92 were living in the South West and South Wales region. This population was largely concentrated in the areas around Bideford and Plymouth. Moving forward 70 years to the 1911 census the total UK count had reached 382 with 230 living in the region. By this time the main population in the Bideford area had expanded significantly both in size and geographical spread, the number in Plymouth had also grown and South Wales was now an additional centre. Whilst it is possible that some may have slipped through the net of the cemsus, particularly in 1841, this does give a view of the where the Prances lived in the 19th centruy and how the population developed in the area. The following map provides a pictorial representation of the census data, the size of the circle reflecting the numbers in that town or district. The following table shows the detailed census data by county. It is sorted in descending order based on the 1911 information.